The upcoming Asia-Pacific Economic Cooperation (APEC) Economic Leaders' meeting is expected to focus on the establishment of a free-trade area in the region, but it faces obstacles and may need some time, analysts said. 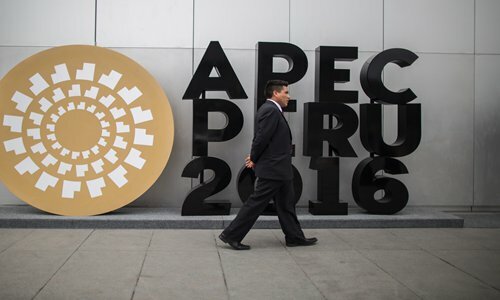 Chinese President Xi Jinping will attend the 24th APEC Economic Leaders' Meeting which will kick off in the Peruvian capital of Lima on Saturday, with the theme "Quality Growth and Human Development." At the meeting, APEC member economies will seek to make decisions to facilitate trade and investment and consolidate liberalization policies, the Xinhua News Agency reported. The idea of a Free Trade Area of the Asia-Pacific (FTAAP) was first raised during the 2006 APEC Economic Leaders' Meeting in Hanoi, Vietnam. During the 2014 APEC meeting in Beijing, APEC member economies pushed forward the FTAAP by sketching out a roadmap for it. A collective strategic study on issues related to the realization of the FTAAP has been completed and the final version of the study, along with recommendations, will be presented to leaders at the Lima meeting, said Xinhua. Bai Ming, a research fellow with a Ministry of Commerce think tank, told the Global Times that the Asia-Pacific economies play a very important role in the world economic landscape. "The area includes three largest economies - the US, China and Japan - and there are also many economies in the area which can supplement each other economically. Therefore, if the FTAAP can be established, it will create great potential of economic value," said Bai. Bai added that under the current circumstances where economic globalization is being hindered, it will be important for countries to achieve regional cooperation like the FTAAP. However, it should be stressed that regional cooperation is not protectionism. It should be made more open. Echoing Bai, Xu Hongcai, deputy chief economist at the China Center for International Economic Exchanges, said the rising wave of de-globalization, such as trade protectionism, will negatively impact the sustainability of the global economy. Working toward the FTAAP could boost development and it is related to the interests of all sides. However, experts pointed out that the exact time for the establishment of the free trade agreement remains unclear as it faces some obstacles. "So far, cooperation in the Asia-Pacific area is mostly fragmented and contains many uncertainties. More importantly, as President-elect Donald Trump seems inclined toward a de-globalization strategy, it may hinder the establishment of the free trade area," said Bai. "If the US, a major economy, shows negative attitude to the free trade area, it will be difficult for China to achieve anything alone," said Xu. During the APEC meeting, US President Barack Obama and Russian President Vladimir Putin are scheduled to give addresses on Saturday and will hold their key meeting. It also might be the last time Xi and Obama get together during his tenure as US president. "During the meeting, economic cooperation such as the development of the free trade area will be the main topic between the two leaders. During Obama's tenure, although there were some conflicts between the two nations, they deepened their economic cooperation and remained stable in the big picture. Aside from China's effort, Obama's contribution should also be recognized," Li Haidong, a professor from the Institute of International Relations at China Foreign Affairs University, told the Global Times. We hope that after Trump takes the office, Obama could still act as a bridge further connecting cooperation between the two countries, said Li. Li also indicated concern over Trump's attitude toward the free trade area after he vowed to renegotiate international free trade agreements in order to protect US jobs. "As Trump has rejected Obama's signature trade initiative in the Asia-Pacific region, the Trans-Pacific Partnership (TPP), he may show an inactive attitude in promoting the FTAAP. His evaluation on the deal remains to be seen," said Li. During an APEC finance ministers' meeting in Lima last month, China' s Assistant Finance Minister Dai Bohua noted that APEC member economies should boost connectivity and create a sound environment for investment and overcome bottlenecks such as poor infrastructure and other problems thwarting economic development, said Xinhua. Juan Carlos Capunay, Peru's ambassador to China, also voiced the hope that with the help of the Belt and Road initiative, Peru will strengthen trade and economic cooperation with China and other Asian countries.